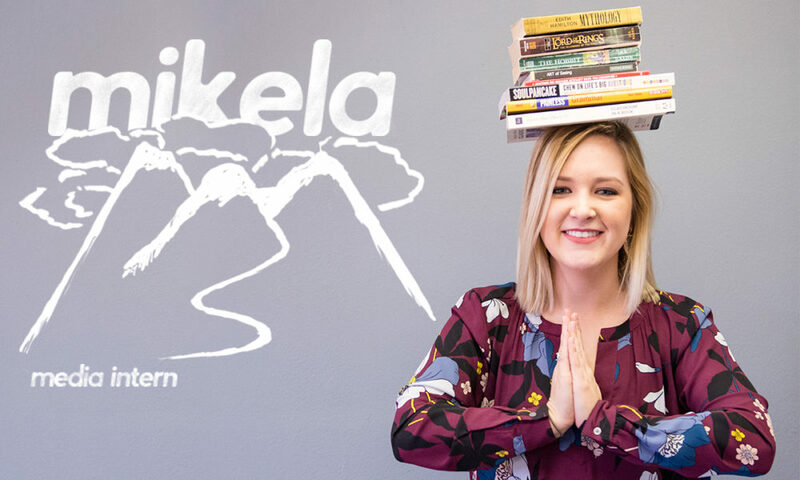 Meet Mikela Johnson, our go-getter media intern! Mikela always comes to the office with an open mind and a smile on her face ready to learn anything and everything that she can! Between morning workouts, class and speed reading her latest book you can find Mikela asking questions and lending a helping hand, no matter the task! This sweet-as-can-be mountain lover is giving us the inside scoop on her experience with the media team! Read below and see for yourself just how impressive she is. What’s a typical day like as an intern at RD Thomas? There’s no such thing as a “typical” day here, and that’s what makes it so fun and exciting! Each day I’m challenged and I love that because it gives me an opportunity to increase my knowledge and develop new skills. I was researching local advertising agencies and came across RD Thomas’ website. I saw that they were hiring for a spring intern so I took a chance and emailed them my resume! How is this internship different from how you expected it would be? Or is it playing out exactly as you thought? Honestly, I didn’t know what to expect. Since I’m not an advertising major I was afraid I would fall behind and have a difficult time learning the ropes. Thankfully I’m surrounded by kind, intelligent and extremely patient people who don’t mind taking the time to answer all of my questions. What are you hoping to learn while interning at RD Thomas? I want to learn everything I can while I’m here! From working the copy machine to creating effective ads, I hope to walk away from this internship with a new set of skills that I can bring to my future career in advertising. What’s the greatest lesson you’ve learned at RD Thomas? You’re never done learning. No matter how much you know you can never know it all in this industry. Technology and consumers are constantly changing and you need to be continually learning in order to keep up. What is the most fun assignment you’ve been given? Probably writing my own blog post. Initially, I was apprehensive about writing a creative piece because I didn’t have any creative writing experience. Fortunately, I have a great support system here who teaches me and guides me in the right direction. It ended up being a lot of fun and I learned a little about myself in the process. What is the worst assignment you’ve been given? I don’t think there is such a thing. Most days I’m working on relevant assignments which are great! But even if I’m making copies or running errands, I still feel like I’m contributing to the overall success of the company. If I do some of the tedious tasks, it gives our outstanding creative and accounts teams more time to do what they do best. What do you do for creative inspiration? I normally listen to music, browse a few blogs or look on Pinterest. What was/is your favorite class at college? I took a consumer behavior class about a year ago that sparked my passion for marketing and advertising. This industry is the perfect combination of my two favorite things: psychology and business. I love how we study trends and patterns of human behavior to strategically position our companies within their market. When you’re at a buffet, how many trays of food do you start off with? Asking me to use Pandora would be like asking me to use a flip phone. Who would you let punch you directly in the face? My parents. They deserve it after putting up with me for 21 years. What are you secretly good at? I’m REALLY good at rolling my ankles, does that count? A warm cup of coffee, cool mountain air, and a good book. What was the last picture you took on your phone? A picture of my beau and I. The Accountant. 10/10 would recommend. I’m very easy to scare so if you accidentally startle me I may jump a few feet. Ask Michelle. Find By Category Select Category Advertising Design Digital Media Mobile Events Christmas Halloween New Year Super Bowl Thanksgiving Valentine’s Day Free Stuff Industry Infographic Our Work Playlists RDTeam Employee Spotlight Recipe Reviews & Critiques Beer Film & Television Food Uncategorized Welcome!